Researchers in Antarctica have found ice with traces of arsenic that originated at copper mines in northern Chile, said a study released Monday. Arsenic, a poisonous substance, is used in smelting copper and is often released into the air during processing. Scientists from Brazil's Polar and Climate Center found it was then traveling more than 6,500 kilometers (4,000 miles) south to Antarctica, in a study due to be published in the journal Atmospheric Environment. The lead author of the study, geologist Franciele Schwanck, said the finding was less alarming for Antarctica than for Chile. The trace levels of the substance are not enough to affect the Antarctic ecosystem, but "part of the contaminant is also being deposited along the way," she told Chilean newspaper La Tercera. Prolonged exposure to arsenic can cause various cancers and chronic diseases, and the discovery of low concentrations in Antarctica probably means there are higher concentrations in Chile, said Schwanck. 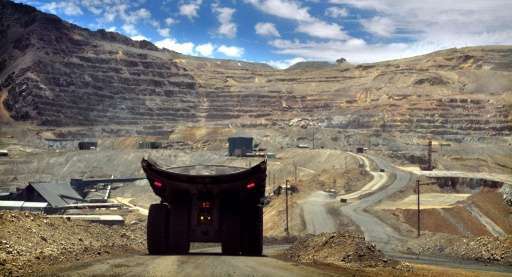 Chile is the world's largest copper producer, accounting for nearly one-third of global supply. Researchers have in the past also found lead and uranium pollution in Antarctica. Extremely interesting website for keeping up to date with science etc.